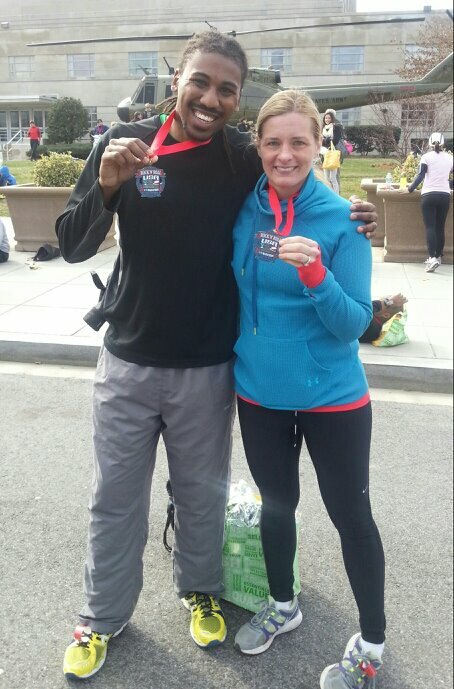 This past weekend I raced in the half marathon that I had been training for since January 1st! It was a great time! Training went well. I was worried about running in the winter but the weather cooperated for the most part. There was only one day that I had to do my long run inside on a treadmill because there was no way I was going to run when it was in the single digits outside! Other than that I, surprisingly, enjoyed getting outside and running in the winter! I ran in snow, fog, dark (by accident! ), with friends, alone, and always with music to push me through. So, by last week I really felt prepared for the race. 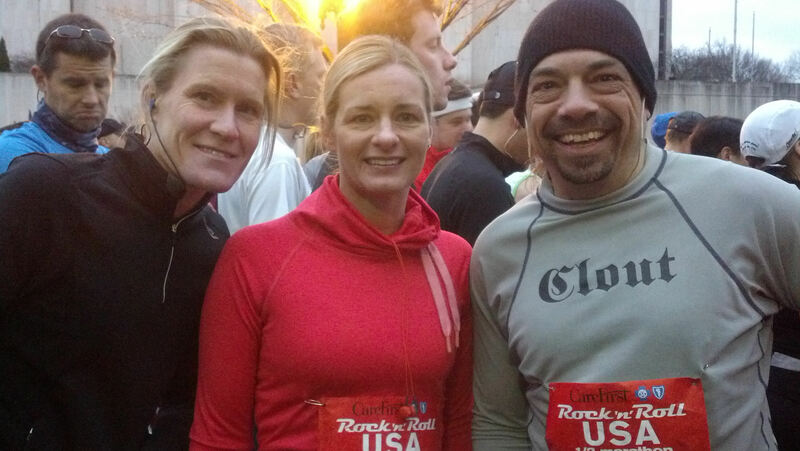 I ran in the Rock ‘n’ Roll Half Marathon in Washington DC. We decided to make it a long weekend and visit museums and monuments while we were down there so we left early Friday morning. After sitting for an hour and 45 minutes in PA without moving due to an accident, we finally made it to DC. That night we met up with my sister and brother-in-law, who was also running the half, for a carb loading dinner! We tried a few different restaurants which had insane waits and finally settled on Pizzeria UNO for some chicken parm; then it was off to bed. I woke up early and sneaked into the bathroom so as to not wake up the rest of the family and began to eat! A yogurt and oatmeal were my pre-race breakfast along with caffeinated coffee. I, for the most part, only drink caffeine before a race so it will really effect me. I was soon jittery and ready to go! A good friend of mine from New Jersey, Kori, had come in the night before and our plan was to meet up in the hotel lobby and then head over to the race. I got to the lobby and called Kori letting her know that I was in the lobby and she told me that she was as well. We both walked all over talking to each other the entire time looking around. Soon we realized that we were at two different hotels! We had booked the same hotel but in different locations in the city! So we hung up and told each other we would meet up at the start line. 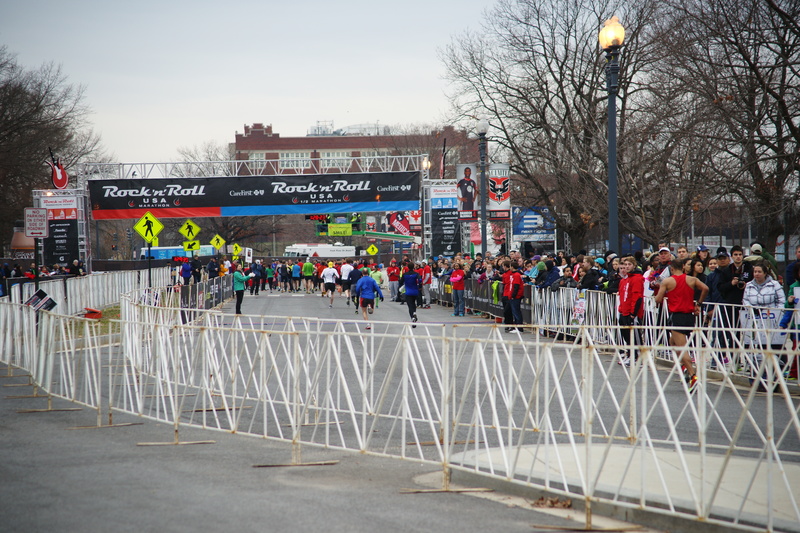 The good thing about 30,000 people running in this race is that there were runners everywhere. I went outside to get a cab and met up with another woman who was running so we shared a cab. She was from California and her goal was to run in ten Rock ‘n’ Roll Marathons this year because then she will receive a special pink medal! I was very impressed! At the gate we met up with the final part of our 4 person crew, Walter, also from New Jersey. We were set! Gate 5 was our starting heat. That meant that we hoped to run the race in one hour and 45 minutes. That was my goal anyway! The national anthem was sung and then the countdown began. The race started! They released a new heat every minute so we only had to wait five minutes until it was our turn. We encouraged each other and then 5..4…3…2…1 and we were off! The first 5 miles I felt great! The weathermen had predicted drizzle for the day but there was no sign of rain. It was cloudy and in the low 40’s; perfect running weather! I ran at a good pace, averaging in the low 7:50’s per mile. It was fun to look around and smile at everyone and listen to conversations. Everyone was so upbeat! Each song that came on my iPod got me pumped! Around mile 6 I ran into my brother-in-law Mike. We ran together for about 5 minutes and then he was off. 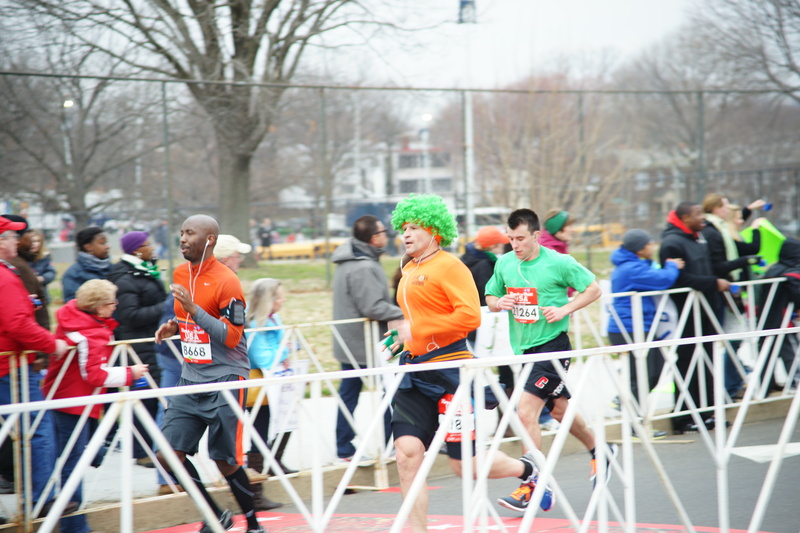 I didn’t see him again until the end of the race; there was no way I could keep up with him! 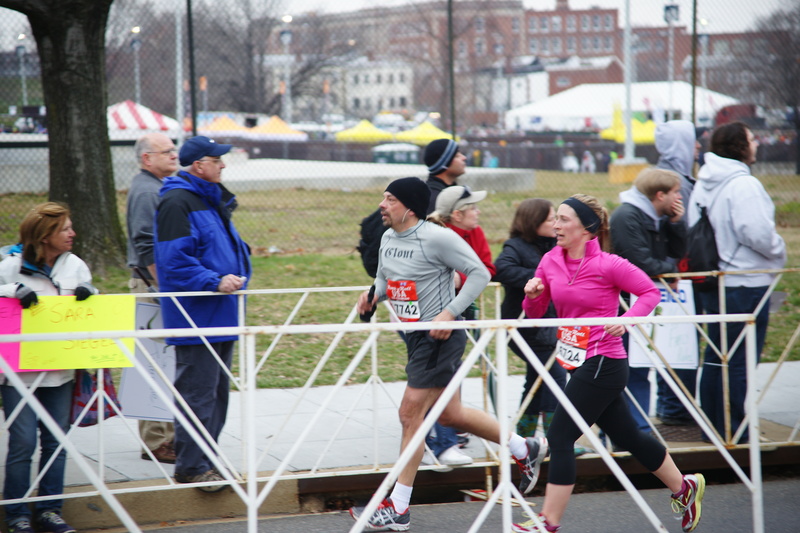 The course was fairly flat with some mild ups and downs. But there was one major hill. It was steep! I train on hills but this one was tough, coming in the middle of the race! But, spectators lined the entire hill cheering us on. It was great! And soon I was at the top! That mile, though, was my first 8:00 minute plus mile. That was when I began to get tired! By mile 11 I could feel myself slowing down. I was tired! But still I plodded on. People began passing me which was kind of discouraging but I really felt like I was doing the best I could. I just kept reminding myself that I was down to a 5K, I could do it! We passed the full marathon break-off and all I could think was that I was so glad I wasn’t doing that! Before I knew it I was running my final mile! Each passing step lead to more and more cheering spectators. I was almost done! But, I was done! 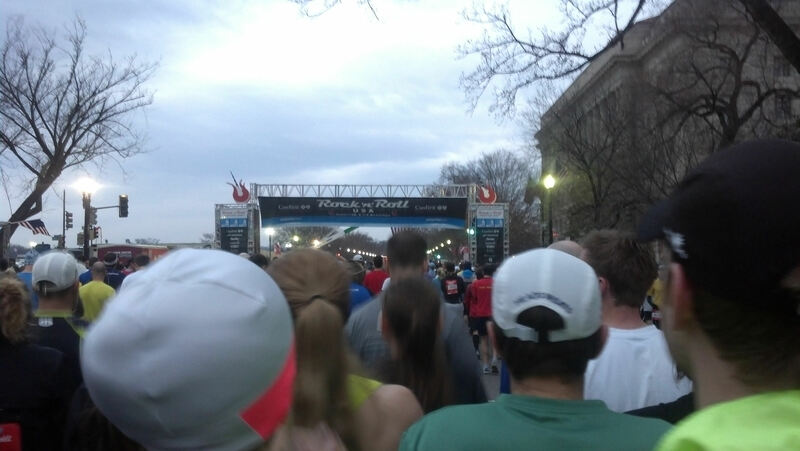 The last .3 miles were hard. I felt myself slowing! I just couldn’t do the final sprint. My legs hurt! So I just kept moving forward. Then, there it was- the finish line! I crossed and smiled, I had done it! 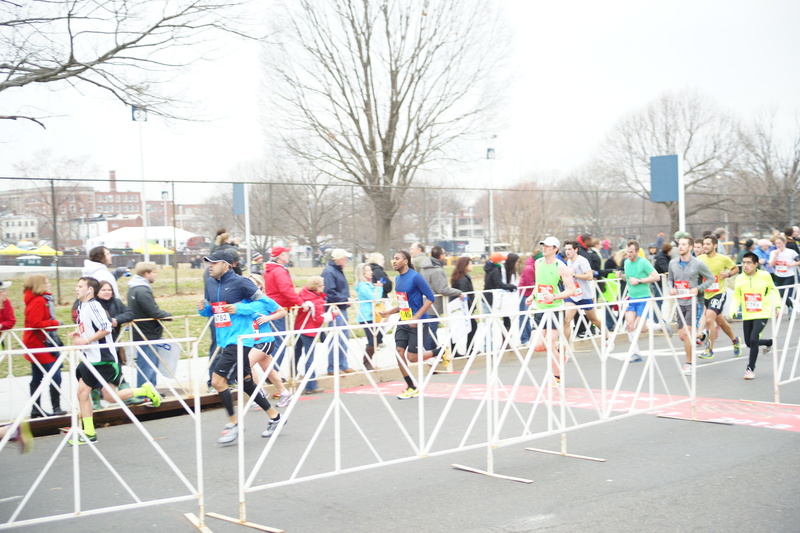 I ended up completing the half in 1:46:33. I was hoping for 1:45 so I was a minute off. But I’m still satisfied with the results! 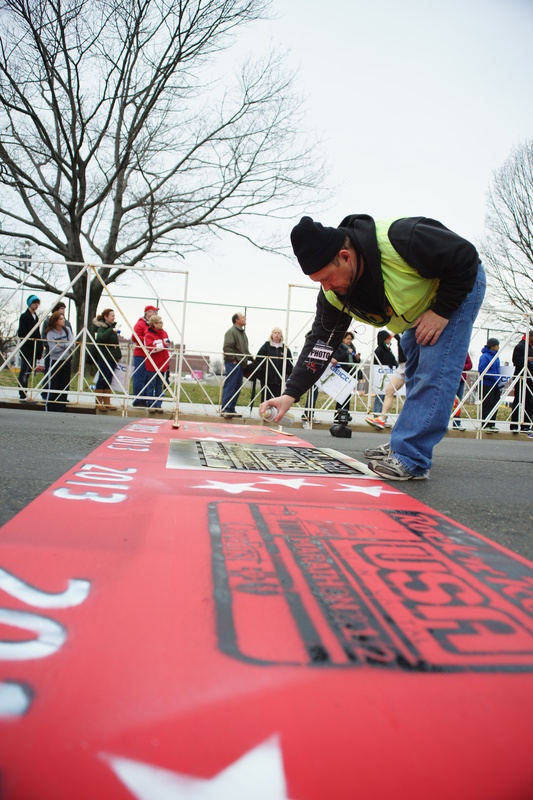 I finished 2037 out of 19982 runners overall, 581 out of 12544 female runners, and 61 out of 1821 in my division. So, I am already figuring out how to shave off that minute! That’s the problem with racing, it becomes addictive! But a good addiction I guess! 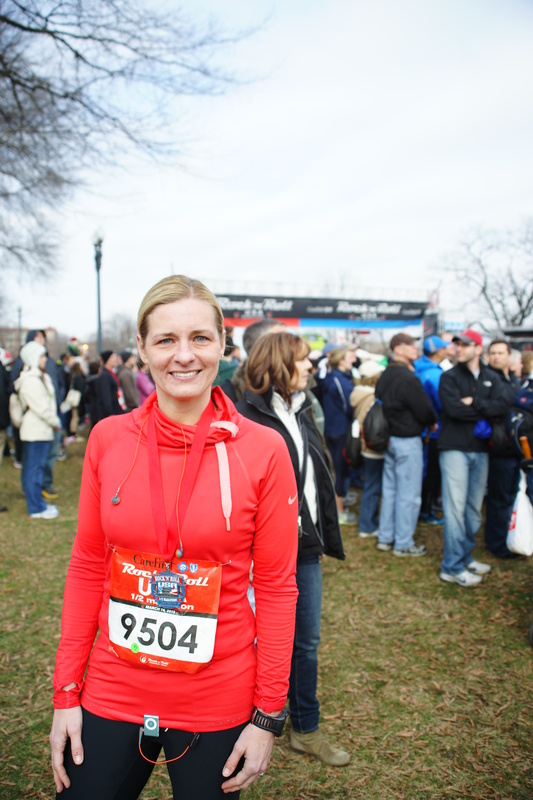 My goal now is to run the New Jersey half marathon in May. I can’t wait! You GO GIRL! You are inspirational to those if us just trying to get motivated for a couch-to-5K start up this spring!! That’s fantastic! You must be so proud! Congratulations, Heather!